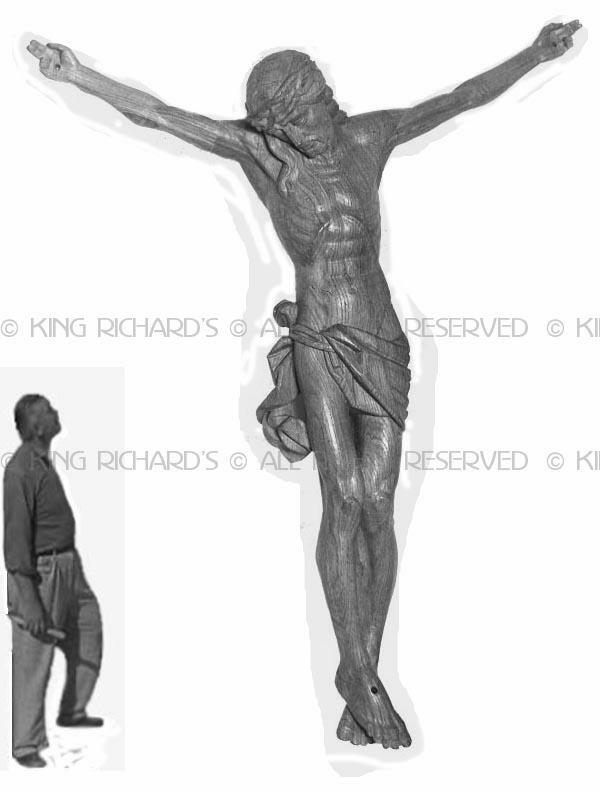 KRMUS-1502-Large church size hand carved wood crucifix with high relief details. Colors, sizes, and style to your specifications. Available in any size over six feet in height. Can also be crafted in marble, bronze or resin. Dimensions: Any size over six feet in height. Call for prices. All King Richard's furniture is hand crafted to order utilizing the finest quality materials and techniques. Our products are not mass produced in a large factory or imported. Customer chooses the finish, styles, sizes, materials and any other alterations to suit your needs. Quartered oak, walnut or mahogany is available for an additional cost. The sizes listed are standard, but can be modified to a reasonable degree if desired. Gold leaf trim details can be supplied at an additional cost. Letters can be carved into the wood at a cost of $30.00 per letter. King Richard's marble products are hand carved from natural stone. We do not use cast or cultured marble. Our marble merchandise is custom made to order, not mass produced. Choice of dimensions, color (s), finishes, specific details, and custom modifications are available with any custom marble order. Dimensions: The dimensions shown are traditional sizes, but can be altered to suit your needs. Colors: There are numerous marble colors to choose from. If you are attempting to match an existing marble piece in your collection, please provide us with a photograph or sample color. Decorative Elements: Borders, trim, panels, molding, finials, spires, columns, capitals, symbols, and statues may be selected to customize your piece. King Richard's also offers other items to coordinate with this piece, for example: altar tables, credence tables, altars, reredos, lecterns, altar rails, baptismal fonts, holy water fonts, etc.